Retirement Savings By Age: Are People Saving Enough For Retirement? One thing I'm often interested in is to hear about what the current actual savings rates are for people in our country. What have they saved? Have they started saving enough? Will a majority of people in our country be secure enough to retire? Have people woken up to the fact that their retirement is creeping up on them, and they're going to need a substantial nest egg in order to maintain the same lifestyle? Today I thought I'd look at some of the numbers that are out there, to see where people are. I came across a study by the Employee Benefit Research Institute where they did a survey of workers to find out where they were with current savings rates, and to see what their confidence was in whether they could retire on what they were saving. Here is what they found for actual savings rates, by age groups. What they found was that not many people were likely to have saved very much for retirement. Most workers have little put away in savings and investments, but older workers are more likely than their younger counterparts to report higher amounts of assets. Workers today are less inclined than those even 10 years ago to believe they'll have enough money in retirement, and less confident that they'll get enough from Social Security. Those very confident in the financial aspects of retirement dropped from 22 percent to 13 percent from 2001-2011. The decline in overall retirement confidence between 2001–2011 is statistically significant across all age groups. Today’s workers are also less likely to be highly confident about being able to pay for basic expenses, medical expenses, or long-term care in retirement. Workers age 55 and older are more likely than younger workers to be very confident that Social Security will continue to provide benefits of at least equal value to the benefits received by retirees today. Have People Actually Calculated How Much They'll Need? So while most people really aren't saving that much, and aren't that confident that they'll have enough, does that mean that they're realizing the dire straights they're in and trying to figure out now how much they'll need? Not necessarily. Despite approaching retirement age, half of workers age 45 and older have not tried to calculate how much money they will need to have saved by the time they retire so that they can live comfortably in retirement. Nevertheless, the likelihood of trying to do a retirement savings needs calculation increases with age. So older folks are more likely to figure out how much they'll need, but still only half are trying to calculate the amount they'll need, while the rest are winging it. Surprising to me was just how little most people think they'll need to retire comfortably in retirement. When all ages are considered over 72% thought they'd need less than 1 million, with 50% thinking they'd need less than $500,000. Workers ages 55 and older are more likely than younger workers to think they will need to accumulate less than $250,000 by the time they retire so that they can live comfortably in retirement. As time goes on and we see the cost of living rise, I thin a lot of these folks are in for a rude awakening when either they don't have enough, or something they were counting on like Social Security isn't there anymore – or not at the same levels they thought it would be. When they were polled more people expected to be working later in life than ten years ago. In 2001 70% of people expected to be retired by the age of 65. In 2011 less than 49% expect to be retired by the same age. While I'm not going over all the data in the linked study, I think we can pull some takeaways from this survey. People are planning on working later in life, and depending on Social Security to a degree. It really is a sobering picture to say the least. If our country does have to take on some austerity measures soon to help cut rising spending, I'm sure there are a lot of people hoping that their level of government benefits aren't cut because most of them have not planned ahead. What do you take away from this picture? Are you planning ahead for a rainy day, and for retirement? Have you figured out how much you need, and have you taken the steps to start saving to reach that amount? I’m planning ahead, but I still need to be more aggressive with my savings and retirement strategy. There are a few things I’m trying to finish up this year that will make saving a greater sum easier: finish my teaching credential by December, and pay off our car! Next year is my big push to strive to save 20 – 25% of our income towards wealth building. I hear ya. We’re doing pretty well now and planning ahead, but in the past we kind of let it slide, and allowed ourselves to think “we’ll worry about it later”. We’re worrying about it now, thankfully it’s not too late! I saved aggressively for years! On an annual basis, I will have more than enough for retirement. I expect to live 25 years in retirement and will withdraw at a 2-3% rate to ensure I have enough money. I think I have it planned fairly well! Great job! You’re one of the few that planned ahead and planned well! 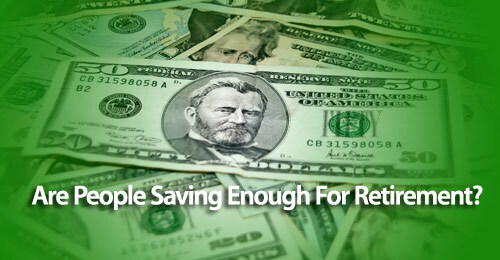 Definitely need to plan ahead and save heavily in order to ensure that one has enough capital. I think that 30% to 50% is a decent target savings rate for the earlier years which allows to accumulate a healthy amount of capital for the later years. Yes lack of saving is a problem and hoplessness is part of it. The ‘retirement calculators’ that attempt to estimate retirement income as percentage of current income are doing everyone a disservice because current income has to cover things that arent needs in retirement such as payroll taxes, college & childcare, retirement funding and a mortgage. Thus they over estimate by 25-75% the income needed and discouraging folks from even trying to save. The question should start with expenses in retirement. Previous Post: Are You Maxing Out Your Tax-Advantaged Accounts? Next Post: Are You Prepared For A Stock Market Drop?